Mt. Tamalpais (2571') in Marin County, California, from certain vantage points has always impressed me as the mirror-image, physically and geographically, as well as spiritual counterpart of the sacred mountain Arunachala (2668') in southern India, whose clockwise circumambulation or giri pradakshina was highly praised by the sage Ramana Maharshi. Stones from Arunachala have actually been placed on Mt. Tam. Ramana and sages before him claimed that merely walking around Arunachala, the embodiment of Siva, was highly efficacious for Self-Realization. In fact he used to say that the benefits which can be gained by meditation and various other forms of mind-control only after great struggle and effort, will be effortlessly gained by those who go round the hill. 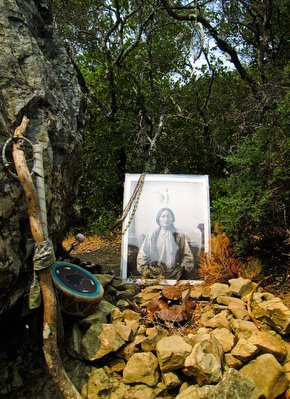 No doubt this can also be attributed to the influence of the many saints and sages who lived there, and were even said to live inside the mountain. Many of the more precipitous routes up the mountain yield delightful surprises. I won't spoil your fun of discovery by naming them all. The intrepid hiker can refer himself to Favorite Ascents of Mt. Tamalpais. Obscure sites for quiet contemplation await the avid explorer on East Peak Fire Trail, Hogsback and Indian Fire trails, although these are rated "extremely steep and marginal", not recommended for descent except for diehard mountain goats, and the latter two are not listed on current maps. (There is no sign forbidding entry at the top end of Hogsback, but at the bottom at the Old Railroad Grade junction a sign warns to keep off to prevent erosion. It has been mostly a pile of rocks for years, however, the rain having washed away any dirt the occasional hiker might displace). Pablo Cassals broke his arm on Hogsback years ago almost ending his brilliant cello career! Nevertheless there used to be an impressive "stupa" as you crest the top (mountain purists and religious fundamentalists sometimes tore it down, as well as other occasional surprises. In fact, reaching the summit of this steep trail you will feel you are in Tibet. The views are spectacular. Tamalpais was home to Coastal Indian tribes for five thousand years, and was called "The Sleeping Maiden" for the mystical Indian Princess lying asleep at the top (the maiden is visible, when viewed from the north, lying on her left side. There is some debate as to whether this is a true Native American legend or a more recent Victorian yarn. In any case, the East Peak is her right shoulder, the tresses of her hair fall to the left). Tam was so sacred to the Miwok that they would not climb to the summit. Coyote, their name for the God who created man, resided at its peak. Numerous redwood "teepees" and other Miwok-like structures can be found in special places off the beaten path on the lower slopes of Mt. Tam. "Many tribes have a legend that we all live on the back of a Great Turtle which forms the North American Continent. The tail of the Great Turtle is Florida, the mouth is the San Francisco Bay. The "holy" right eye is Mt. Tamalpais. The left eye is Mount Diablo in the East Bay." (Karen Nakamura, Mill Valley Herald). Both mountains have long been considered sacred. Many of the plains Indians, such as the Lakota Sioux, are said to have made the long journey west carrying their tribal leaders on litters for burial on the slopes of Mt. Tam. Difficult-to-find burial mounds still exist.